SF Taxi Media: Quick Thought On Yesterday's MTA Board Of Directors Meeting. Cab Companies Want 500 More Cabs. By John Han. Quick Thought On Yesterday's MTA Board Of Directors Meeting. Cab Companies Want 500 More Cabs. By John Han. Cab company reps were at it again, taking the opportunity at Tuesday's MTA Board of Directors meeting, to urge the directors to issue 500 more taxicabs. This, after the MTA has already authorized 87 new medallions in August. Under item #17 of the agenda, which included lowering medallion seller's ages from 70 to 65 under the Pilot Program, Yellow Cab manager Richie Wiener, added that the City should put out another 100 medallions right away. Then, Marty Smith, manager of Luxor Cab, acknowledged Wiener's comment, but took the bolder step to urge the City that it should be 500. I would like to take this moment to try to bring to the attention of readers, and hopefully the regulators, a response to this plea. This excerpt below is from a 2001study entitled, "Making Taxis Work In San Francisco", and was conducted by Nelson Nygaard, the same consulting firm that just released and presented to the MTA, its report on credit card fees, rear seat PIMs, and electronic waybills. "Poor availability does not necessarily mean that there are too few taxis on the streets. Availability is not the same as supply, because both supply and distribution determine availability. Poor availability in some parts of the city may be due to taxis clustering at more lucrative locations such as the airport or downtown hotels, rather than to a shortage of cabs. Dispatch technology, the number of taxis handled by each dispatch service, and the incentives for drivers to accept radio orders are other important factors that affect availability, but not the overall supply of licensed taxis. Structural problems within the taxi industry, such as poor enforcement of regulations and the lack of incentives for firms to carry more passengers, contribute to poor availability. The extent to which availability problems are caused by too few licensed taxis is difficult to say, in the absence of incentives for firms to maximize the efficiency of their fleet and improve distribution." "Our studies determined that the primary reason for this unreliability is that neither the drivers nor the companies have a direct interest in attracting passengers. Taxi companies are currently not in the business of carrying passengers. They might more accurately be described as vehicle leasing firms, rather than taxi companies. They derive revenue from leasing vehicles to drivers, for a flat fee per shift. It makes no difference to a firm’s revenues if the driver carries one passenger or fifty passengers during his or her shift, at least in the short run. This means that firms have little interest in improvements that could help to boost overall taxi ridership. Marketing is virtually non-existent, and there is little incentive to improve efficiency, in terms of the percentage of time a taxi is carrying passengers, or performance. Therefore, taxi regulators are posed with the task of finding creative ways to get more and more people into the available taxis that already exist, but may face opposition, or at least lack of willingness from large and powerful cab companies. The companies' primary motive is not necessarily to increase ridership in the already existing fleet, but to achieve more and more new medallions to ever increase the size of their fleets. This is not necessarily a harmonious objective between the two entities. It may be in the City's interest to maximize the efficiency of the existing fleet, since merely increasing the size of the fleet may contribute to traffic congestion and global warming. Click Here to read about the Open Taxi Access program and what happened to it. While Supervisor Wiener's goals going into office included centralized dispatch, his only notable efforts since having been in office has been to push for hundreds of more cabs, harmonizing more with a large cab company's agenda. 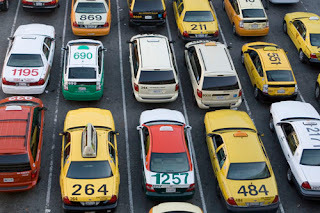 Not only do the cab companies want 500 more cabs, it may be fair to predict they will also push for a gate increase in 2012, citing rising operating costs. There has already been open discourse and murmuring from companies about a gate increase. For now, cab drivers are able to enjoy their first meter increase in eight years to cover rising costs of living, without it being accompanied by a gate increase. Thanks to the MTA for that so far. How Weiner and Smith, enjoy their additional profit taking! SFMTA should also create 3 eight-hour shifts instead of 2 twelve-hour shifts if they ever wish to reduce stress among cab drivers; and that will help increase service quality. Good article John. Keep up the good work. Hopefully SFMTA will listen to you and also creates a unified dispatch system. Driving under the influence is considered a serious crime in the United States today. S multiple DUI can lead to severe prison sentences and heavy fines. So you charge to go to the airport, your researching your options and you are not abiding which advantage to choose. Richie Weiner and Lasar always say they needs 500 more cabs. It was pretty clear that Hayashi and the MTA aren't interested in jumping on the bandwagon. They are committed to not doing anything until the subject has been studied in some scientific way.